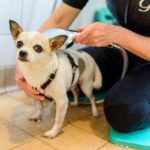 I am the lead small animal Rehabilitation Therapist at Gilabbey Veterinary Hospital, Cork and its referral small animal physiotherapy centre, Cork Canine Rehabilitation Centre (CCRC), which specialises in land and water based physiotherapy. As a qualified veterinary nurse working in a small animal veterinary referral hospital I was eager to improve inpatient and outpatient post-operative care as well as further my career. I was first introduced to K9HS when I attended a one-day taster course on canine aquatic and hydrotherapy in February 2011. That one-day event introduced me to a whole new concept in veterinary physiotherapy assessment and treatment techniques, which were delivered in a respectful, considerate and professional manner towards their canine patients. Since then I have completed the IRVAP accreditied Diploma in Canine Aqua and Hydrotherapy and the ABC Awards Level 3 Certificate in Small Animal Hydrotherapy at K9HS. In 2012 I completed a post graduate Certificate in Small Animal Rehabilitation Therapy through Nottingham University Vet School. 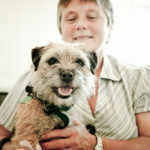 Throughout this period I gained invaluable small animal physiotherapy and hydrotherapy clinical experience, training and mentorship from Barbara Houlding. 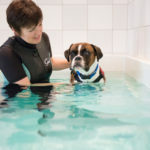 K9HS is a state of the art physiotherapy and hydrotherapy referral centre, which is specifically designed to promote a calm and positive learning environment within a clinical setting. Multiple learning opportunities were provided throughout my training in the form of regular clinical placements incorporating land and water based practicals, on-line lectures, anatomy labs, interactive group discussions, guest lecturers from different disciplines and a diverse range of case studies. As principal educator, Barbara provided excellent mentoring and support, facilitating me in reaching my learning goals by utilising a positive teaching style that addressed my individual needs. Being part of a small learning group for each course was hugely beneficial for me and gave me the opportunity to learn more and gain so much hands on experience, which is vital for my clinical progression in this profession. Barbara is always available for clinical advice and support, which is critical for the newly qualified therapist and she continues to be a fantastic mentor. Today I utilise my extensive experience in the nursing care of orthopaedic and neurological patients coupled with my clinical skills and knowledge in small animal physiotherapy to promote high quality land and water based physiotherapy treatment for the small animal patient. CCRC collaborates with K9HS in many different areas including CPD events aimed at the veterinary profession and those interested in small animal physiotherapy, group case study discussions, business management and promotion, and progression of clinical skills in treatment of athletic and working dogs and with the complex neurological small animal patient. Deirdre Duggan RVN, Dip Canine Aqua & Hydrotherapy, ABC level 3 Certificate Hydrotherapy, PGCert Small Animal Rehabilitation, MIRVAP.